High road employers who post salary ranges, limit the use of prior salary, conduct pay audits, and protect employees who discuss pay at work. Access the coalition toolkit and learn more about the gender wage gap or other Equal Pay Day events at www.equalpaydayforall.org. 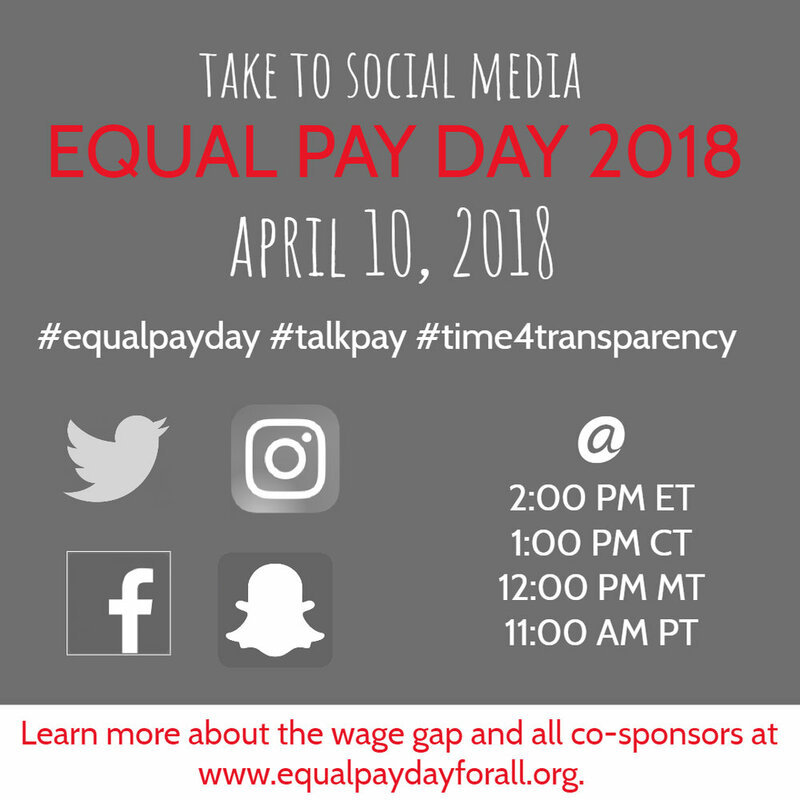 WHERE: Twitter, Facebook, Instagram, and Snapchat using hashtags #equalpayday, #talkpay, and #time4transparency. BACKGROUND: Equal Pay Day -- April 10, 2018 -- is the approximate date the typical woman must work to make what the typical man made at the end of 2017. Women who work full time, year-round in the United States are paid only 80 cents for every dollar paid to their male counterparts. Over a 40-year career, this can cost a woman over $400,000. When you factor in race, the wage gap is wider. When compared to White, non-Hispanic men, Latinas earn 54 cents for every dollar, Black women earn 63 cents for every dollar, and White women earn 79 cents for every dollar. Therefore, while Equal Pay Day compares all women to all men, the Equal Pay Days for women of color fall much later in the year. Women of color, therefore, must work far longer to achieve equity, while losing far more over the course of their lifetimes. That’s not equitable at all. And in 2018, it’s no longer acceptable. It’s time for multi-pronged solutions that seek to close the gender wage gap by addressing its many contributors: lack of pay transparency, hiring, pay and promotion discrimination based on gender and at the intersections of race, national origin, sexual orientation, pregnancy, and caregiver status; occupational segregation; wage theft and an inadequate minimum wage; unfair workplace policies; lack of paid leave; lack of affordable childcare; and sexual harassment in the workplace.